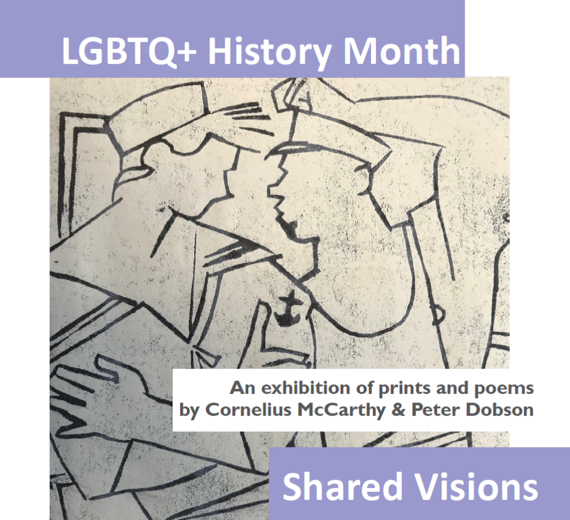 February is LGBTQ+ History Month and we are delighted to mark the occasion with a display of artwork by Stepney based artist Cornelius McCarthy (1935-2009) whose sketchbooks and a number of paintings we hold in our collections. You may recall we hosted a retrospective of his paintings in 2015 which had been organised by the late artist's friend and biographer Peter Dobson. Sadly, Peter died last year, leaving behind a number of poems inspired by his appreciation for Cornelius's artwork and their nearly 50 years' long friendship. 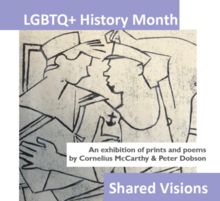 We are honoured to have been asked by Peter's partner to host a display of rarely seen prints by Cornelius McCarthy alongside some of Peter's poetry in commemoration of both artists. The exhibition, Shared Visions, will be on our landing from 2-28 February. Cornelius and Peter lived through a period of considerable social change and a gradual relaxation, at least by many, in attitudes towards homosexuality. In their lives and in their work both strove to reach out to others, to share their ideas and values. They both drew on a considerable knowledge of art and literary history as well as their lived experience, and both expressed their feelings about the beauty of the male body in their art. There will be an evening wine reception on Thursday 21 February, 6.00-8.00pm featuring a short speech by Stewart Hardman of Adonis Art, and a short poetry reading by Stan Lloyd. If you would like to attend this event, please email localhistory@towerhamlets.gov.uk to aid us in planning the catering. On the same evening, our Education Room will host a special event organised by Tower Hamlets LGBT Community Forum, featuring comedian Rosie Wilby performing parts of her stand-up show Is Monogamy Dead? along with audience discussion. The timescales for each event will be published on our website www.ideastore.co.uk nearer the time and will allow attendees to attend both events if they so wish.